Jellyfish are simple beings. They do not have brains, bones, lungs, or intestines. They do have organized tissues and a nervous system and are the oldest known multi-organism creature. These gelatinous swimmers have been around for more than 500 million years, making the existence of dinosaurs seem recent and short-lived. They are found in every ocean and have become invasive in some parts of the world. Jellyfish are famous for their stings, which can be lethal within minutes from some species. They are also a popular food in China and Japan. But these ancient creatures are more than just stinging annoyances or Asian cuisine. They are incredibly versatile in ways that will surprise you. A big step up from a goldfish in a bowl is a jellyfish in a specialized tank. “Moon jellyfish” is a term used to describe the Aurelia genus of jellyfish, which includes several similar species that are difficult to distinguish from one another without sampling their DNA. They are commonly called moon jellyfish because their round, white bodies resemble a full Moon. Moon jellyfish are the most popular jellyfish kept as pets. They thrive in temperatures near 27 degrees Celsius (80 °F), which is typical for heated home aquariums. They are fed frozen or freeze-dried brine shrimp, copepods, phytoplankton, and minced seafood. Some enthusiasts not only keep them as pets but also breed them. Moon jellyfish cannot survive in a simple tank. They require constant water current to stay suspended and use their tentacles to capture food. Moon jellyfish are somewhat fragile, so their tanks must be free of any sharp edges. Even the sides of an aquarium can cause injury, so specialized tanks feature a circular flow that allows the invertebrate to float around without coming into contact with any part of the tank. 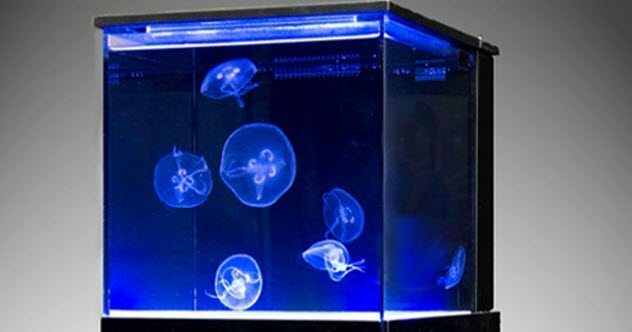 As moon jellyfish do not require light, many jellyfish tanks feature LED lighting that accentuates the translucent creature as it drifts in the water, creating a living lava lamp. Organic farming has become more popular not only because of rising consumer demand for organic products but also because organic farming is easier on the land, allowing for more sustainable agriculture practices. However, without chemical fertilizers and herbicides, organic farms can find it challenging to control weeds and produce high harvest yields. Jellyfish fertilizer happens to be a solution for both issues. Desalinated and dried jellyfish chips are an organic fertilizer that boosts the nutrient content of the soil while inhibiting weed growth. In Japan, the harvest yield from rice fields fertilized with jellyfish chips was proven to be just as high as the yield from chemically fertilized fields. Jellyfish-fertilized rice fields consistently yielded better results than fields enriched with rice bran, another organic fertilizer. Jellyfish chips have also been used to rejuvenate forests. In South Korea, a 2012 forest fire decimated trees on Mount Jubong. Jellyfish fertilizer was used to improve the soil, increasing moisture and nutrient content, before new seedlings were planted. With the right application rate of jellyfish chips, the seedlings showed enhanced growth. The positive results will likely lead to an increase in the use of jellyfish fertilizer in future forest restoration projects. Green fluorescent protein (GFP) occurs naturally in jellyfish. Using GFP, scientists can attach glow-in-the-dark tags to certain cells and then track their progress throughout the body. For example, GFP was attached to pancreatic cells that produce insulin to examine how they operate, which helps inform new diabetic treatments. GFP can also be used to track the spread of infections such as HIV. GFP was such an important scientific breakthrough that the researchers responsible for developing its use were awarded the Nobel Prize in 2008. GFP has been crucial in advancing studies of the nervous system. This protein can be modified to produce nearly 100 different colors, with different hues assigned to separate cells in the same area. 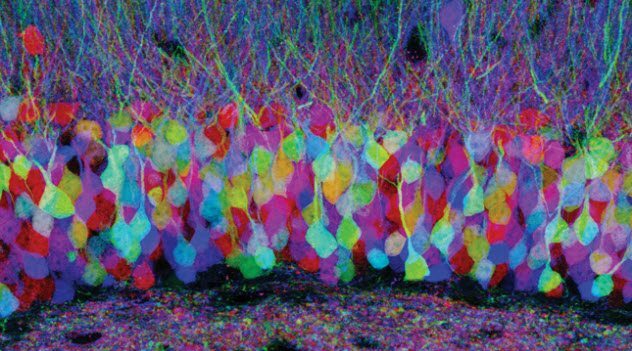 This allows scientists to differentiate between the billions of cells that comprise the brain and observe the individual pathways of neighboring cells. Brain cells are so close together and look so similar that it was an impossible task to follow the progress of distinct cells before GFP. Examining specific cell activity in the brain helps scientists to better understand and treat conditions such as epilepsy and Alzheimer’s disease. Microscopic pieces of plastic (aka microplastic) are a relatively new environmental concern. One source of microplastic is microbeads, the tiny balls found in certain shower gels that are now banned in several countries such as the US, Canada, and the UK. Microplastic also comes from the breakdown of synthetic fibers during washing machine cycles and the disintegration of large plastics over time. In response to rising concerns about microplastic pollution in oceans, rivers, and lakes, the GoJelly project was born. GoJelly seeks to solve the problem using jellyfish, simultaneously decreasing the population of these invasive creatures as well as the level of microplastic pollution in the waterways. Sewage treatment plants are not currently capable of trapping microplastic because the pieces are too small. But studies have shown that jellyfish mucus binds to microplastic, so biofilters made with jellyfish mucus could be used in sewage treatment plants to fix this issue. Jellyfish biofilters could also be used in factories and manufacturing plants that produce microplastic waste. Charlie Francis is the owner of an experimental ice cream company called Lick Me I’m Delicious. His company is known for crazy ice cream flavors such as roast beef and chili. 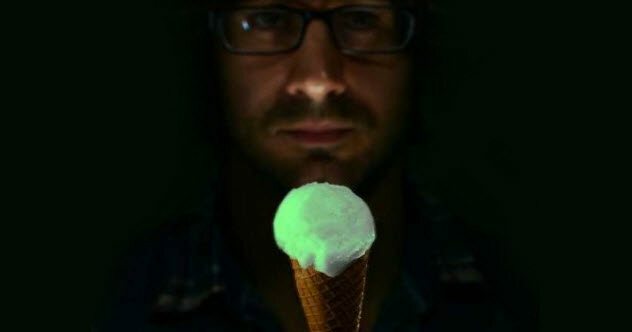 They also produced the world’s first glow-in-the-dark ice cream using jellyfish protein. Francis learned about the bioluminescent properties of jellyfish while reading a research paper. He reached out to a lab in China that was already working on synthesizing the protein. The ice cream does not glow as it is scooped out. Instead, the proteins react to heat. So when a warm tongue licks the ice cream, it starts to fluoresce. It sounds like a fun treat for kids to enjoy, but it is a pricey one at more than $200 per scoop. A former NASA biologist also applied the bioluminescence of jellyfish to something consumable. Josiah Zayner created fluorescent yeast kits that allow home brewers to make their own glow-in-the-dark beer. But Zayner was looking to create more than just a drink to serve at raves. According to his website, Zayner’s aim in producing the fluorescent yeast kit is to encourage people to incorporate synthetic biology and genetic design into their everyday lives. He envisions a future full of genetic engineering, and he wants to inspire people to begin exploring the possibilities. Japanese chemists analyzed the innards of the jellyfish that crowd their shores, seeking new uses for the plentiful creatures. They discovered that the most prevalent protein in jellyfish is mucin, a long protein chain containing carbohydrates that retain moisture. Jellyfish use mucin to clean themselves and defend against predators. Humans also produce mucin for similar reasons. 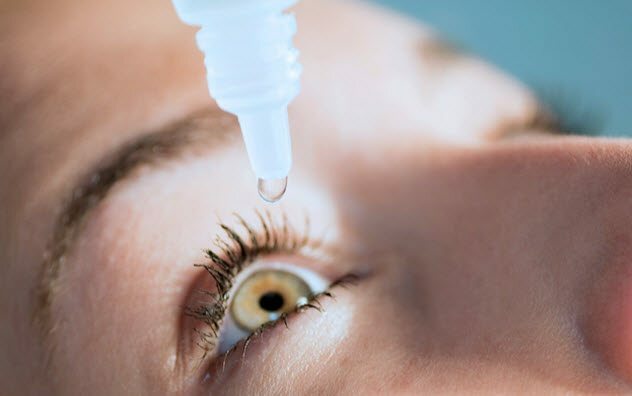 Mucin keeps our eyeballs moist and is the basis of mucus in the nose that protects against invading bacteria. Mucins are already used in the health and beauty industry. But they are extracted from pig stomachs and cow saliva, which makes them expensive. Harvesting jellyfish mucin would provide a low-cost substitute. Mucins are used in artificial tears, food additives, and cosmetic products. Scientists continue to find new uses for the powerhouse of green fluorescent protein (GFP) that comes from jellyfish. The latest is using the green goo as an energy source. A team of Swedish scientists created a cell that converted ultraviolet light into energy. The cell was made of two aluminum electrodes that had a small gap between them. When a droplet of GFP was placed in the gap, it formed strands that connected the two electrodes. When the cell was exposed to ultraviolet light, it generated an electrical current. GFP still has a long way to go before it can power a neighborhood or even a flashlight, but there are multiple benefits to using it as an energy source. GFP is inexpensive to harvest. The jellyfish population continues to grow, providing a strong supply of the substance. Finally, GFP can be used in a self-contained cell that does not require an outside light source by including natural light-producing photons in the cell to activate the fluorescent protein. 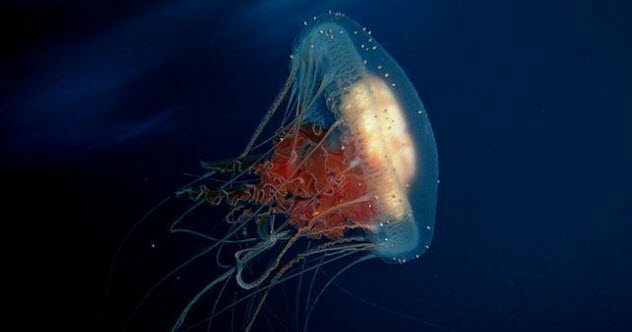 Scientists began sending jellyfish into space in 1991. They wanted to examine the developmental effects of being born and raised in microgravity. After the jellyfish reproduced, the space-born creatures provided valuable insight when they were returned to Earth. Jellyfish use calcium sulfate crystals to sense gravity. These crystals ring the edge of their bodies, encased in small pockets. When jellyfish move, the crystals also move and settle at the bottom of their pockets, which is how jellyfish determine up from down. The space-born jellyfish developed the gravity-sensing crystals normally. But after they were returned to Earth, the jellyfish lacked the ability to swim. Their movements were abnormal and unproductive compared to their Earth-born relatives. The gravity crystals were there, but they did not seem to be operating effectively. Humans also sense gravity using calcium crystals. Ours are located in the inner ear, and these crystals tell our brains which way is up when we move. The gravity issues faced by space-born jellyfish indicate that space-born humans would suffer the same problem if they returned to Earth, resulting in a constant case of extreme vertigo. The Nemopilema nomurai (aka Nomura’s jellyfish) is one of the largest species of jellyfish. The giant creature weighs up to 204 kilograms (450 lb) and measures 2 meters (6.6 ft) wide. 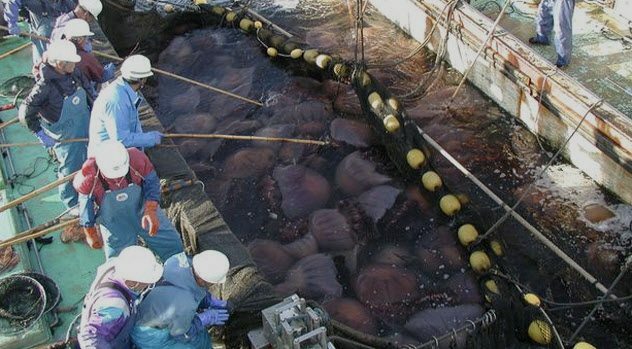 Nomura’s jellyfish have been swarming the Sea of Japan since the early 2000s. They have devastated Japan’s fishing industry and negatively affected the livelihoods of many who live on the coast. But a group of high school students decided that when life gives you giant jellyfish, you should make caramels. Students from Obama Fisheries High School in Obama, Japan, boiled the pesky jellyfish into a paste before grinding it into tiny particles. Then they mixed the jellyfish powder with sugar and starch syrup to create sweet-and-salty candies. 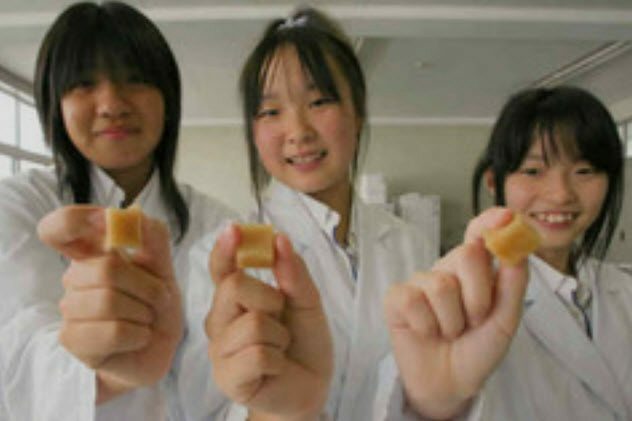 The students contacted the Japan Aerospace Exploration Agency and requested that their jellyfish caramels be added to the menu for astronauts traveling to the International Space Station. The caramels are not the first jellyfish treat cooked up by the students. They also use jellyfish powder to bake cookies, which are sold by the box in a local store. The beaches in Israel are crowded with jellyfish, and landfills around the world are filled with disposable diapers that take hundreds of years to biodegrade. An Israeli company found a unique way to address both issues by using jellyfish to create biodegradable diapers. 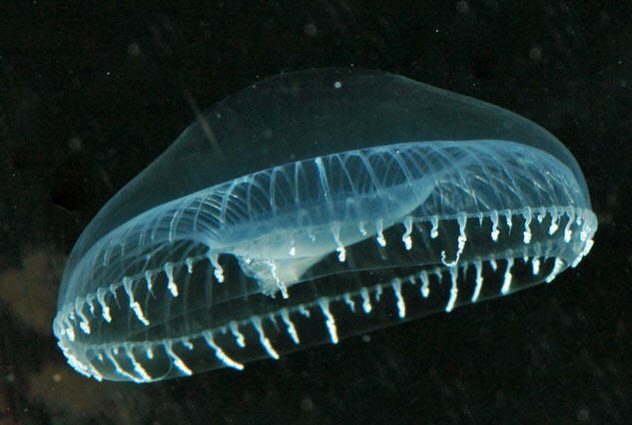 Shachar Richter, a material scientist, came up with the concept while studying jellyfish flesh. The flesh is capable of holding large quantities of liquid without dissolving or disintegrating. Richter decided to use the impressive absorption properties of jellyfish flesh to create a new product. The result was “hydromash,” a material capable of absorbing more than several times its volume. The process of creating hydromash involves breaking down the jellyfish flesh and mixing it with antibacterial nanoparticles. The result is a product that is strong, absorbent, and flexible. It also biodegrades in fewer than 30 days. Hydromash is used to produce diapers for infants and adults, feminine hygiene products, and medical bandages. 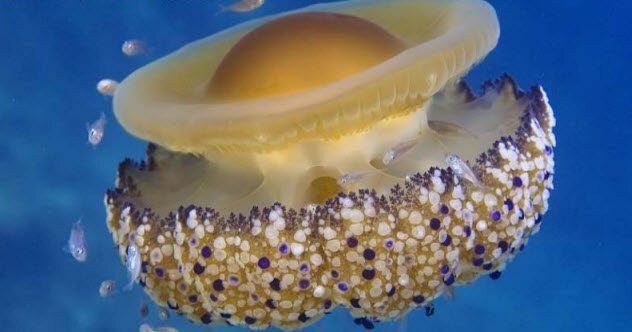 For more bizarre facts about sea creatures, check out 10 Otherworldly Sea Creatures You’ve Never Heard Of and 10 Creepy Deep-Sea Creatures You Never Heard Of.